Soo Line 2719 - this beautiful 4-6-2 Pacific was built by ALCO in 1923. Owned by the Locomotive & Tower Preservation Fund, it is leased to the Lake Superior Railroad Museum in Duluth, Minnesota, where it operates for only a few weekends per year plus occasional charters. Our program will show you what it takes to bring the engine back to life for the first revenue trip of the season from trackside and inside. We also present two all-day round trips between Duluth and Two Harbors, Minnesota, along the shore of Lake Superior. Want more? We’ll ride along with the engine crew to show what goes on inside the cab as the engine is turned on Canadian National’s Two Harbors wye. 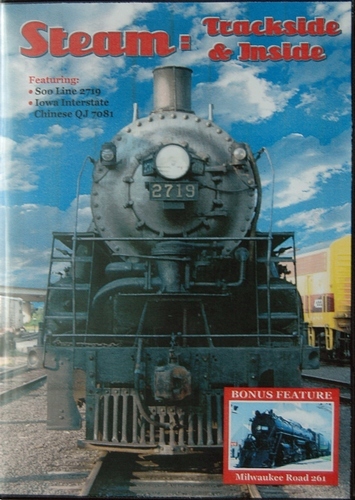 Iowa Interstate Chinese QJ 7081 - over 4700 of these 2-10-2 engines were built, mostly by Datong Locomotive Works. In 2006, Railroad Development Corporation, parent company of Iowa Interstate (IAIS), purchased two and brought them to Newton, Iowa. Since then there have been only a few outings. We are pleased to be able to present 7081 performing fundraising trips in support of the Earlham, Anita, and Atlantic Fire Departments. All three western Iowa communities are served by IAIS. Our coverage includes a ferry move from Newton to Earlham the day before the weekend fundraisers, the Saturday trips from Earlham to Stuart, the ferry move to Atlantic, and the Sunday trips between Atlantic and Anita. Bonus Feature: Milwaukee Road 261 - The Milwaukee Road Historical Association held its 2001 convention in Montevideo, Minnesota. Montevideo was a division point on the Milwaukee and is the home of the Milwaukee Road Heritage Center. Today the line is operated by the Twin Cities & Western Railroad. Our program, using analog video from our archives, presents convention trips east and west of Montevideo, both trackside and inside the train. Some of the convention trips had a rare all-Milwaukee Road consist pulled by the handsome 261. We also follow the charter train as it returns to Minneapolis.